Some people equate the opposition on Rabbainu Na Nach Nachma Nachman MeUman to the opposition on Yosef Hatzadik from his brothers. However it is impossible for us to comprehend the matters and affairs of the holy tribes. E.g. in the will of Naftali the son of Yaakov, Naftali describes two dreams that he had in which God revealed to him how Yosef would cause division, strife, and destruction C”V, Naftali describes how he related these revelations to Our Father Yaakov, and how Yaakov accepted them and wept. 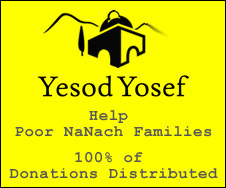 Based on these revelations Naftali commands his offspring not to follow the children of Yosef. These revelations only came true after many generations, and they were supposed to follow Yosef himself. Nothing of this sort was impetus for the opposition on Our Holy Master Na Nach Nachma Nachman MeUman. Also Rabbainu said that by meeting even one of his simple followers a person can merit to be a Tzadik. Also Rabbainu said that the Mushiach will come from his progeny, may he come soon, amen. The talmid (which is Rabbenu) is Saba Na Nach and the son (according to me) is the petek and the Moshiah is (according to Saba) the petek and according to Saba in I.A. 's dream "Na Nach". Today is Rabbi Natan's day. Which is so holy that according to Rabbi Ovadia Yosef would even be fasted on Shabbas if it fell on that day! If Saba is the talmid, then what are the original hassidim? At Rabbenu's bed they said "who will give us tchouva?" and Rabbenu answered "why are you worried I go in front of you?". This means Rabenu confirms they had not "done" tchouva yet. Saba on the other hand, confirms that he was a pure as a new born babe by the age of 70- 80. But he was ALREADY the precious student at 30 something! Rabbenu did NOT reveal the petek to them. Since both the Sefer Ha Nischaf and the works of the Bal Shem Tov where "savable" by the sacrifice of the life of the author, then realize that these works are like a living human being! Rabbenu's son was supposed to be the Moshiah, but he died and as Rabbenu said- I could bring the Moshiah NOW, but it is preferable that (10 of) you do tchouva. Apparently, Rabbenu did not leave us without a Moshiah (his son). Therefore: the petek is the Moshiah, like Saba says. If you wear the Na Nach, and promote the Petek then you are "roe pnei ha Moshiah" and you are like The Cohen Ha Gadol such is the power of this annointing oil. This explains why Saba says, in the dream, Na Nach is the Moshiah. If you are serious about the Geoula then the book Ebay Ha Nachal is UNAVOIDABLE even though it wasen't brought to the press by Rabbi Natan.